Mainland is the largest of the Orkney islands, and is reached from the Scottish mainland by ferry across the Pentland Firth or from Aberdeen. Kirkwall is on the north side, and, as the island’s chief town, is signposted from all directions. The cathedral itself is set on a hill about a quarter mile south of the harbour. Parking is easy and cheap. 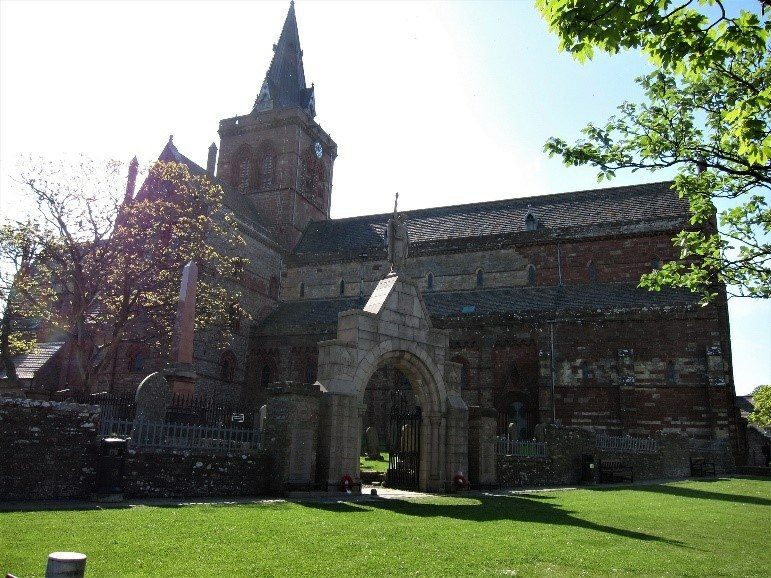 St Magnus Cathedral is a superb example of Romanesque architecture, the majority of which dates to the 12th and 13th centuries. Built in a pleasing combination of the local red sandstone and yellow sandstone from one of the more northern island of the Orkney archipelago, it dominates the skyline in the town of Kirkwall. The cathedral is open from 8.30am to 4pm, although services are held at various times, which may prevent access to parts of the building. Entrance to the cathedral is through the thirteenth century west door. 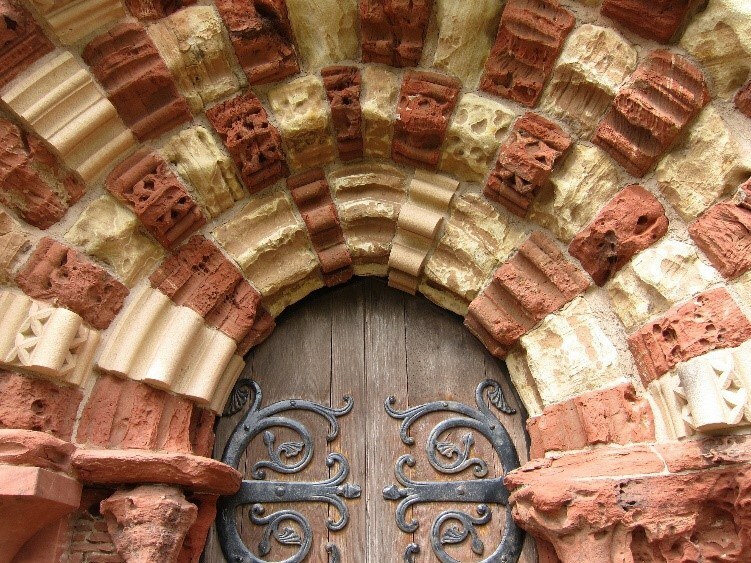 Despite the softness of sandstone, the west door still gives a very fine impression of its original form. The cathedral is not huge, but it has a warm and tranquil atmosphere – the great east window (19th – 20th century restored glass) pours light down the choir and nave. 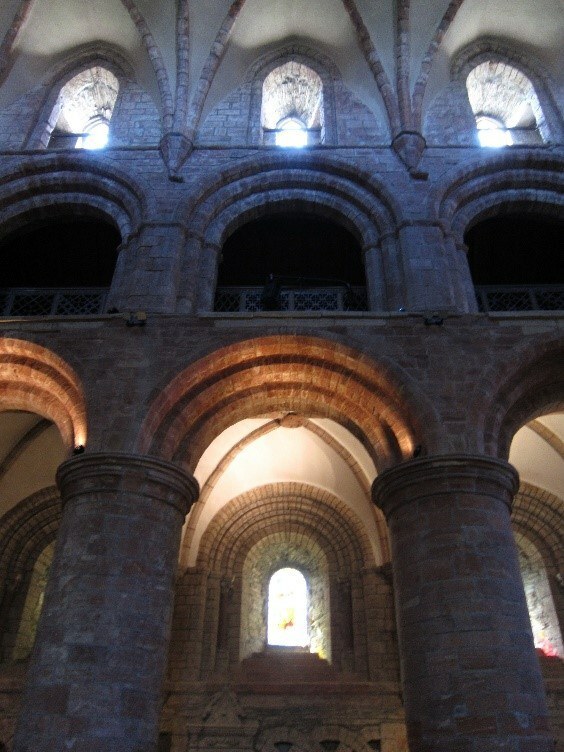 The stout columns are reminiscent of the design of Durham Cathedral, and it is believed that the same master mason, or at least his disciples, may have worked on St Magnus. At the top of the north aisle is a grand Victorian tomb, containing the mortal remains of William Balfour Baikie, born at Kirkwall in 1824, dying in Sierra Leone in 1864. A doctor in the Royal Navy, he took part in various British explorations of Africa, recording the flora and fauna. In the spirit of the age, he set up a settlement, trading station and mission in Lokoja. 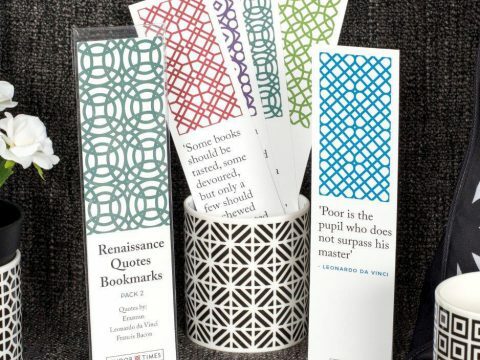 Today we may admire his anti-slave trade stance, whilst being more questioning of his missionary zeal. The eastern end of the cathedral is dedicated to its founder St Rognvald (pr. Ronald), Earl of Orkney. His actual relics are built into the north-west pillar of the crossing. The choir is furnished with extremely high-quality carved wood, dating from the restoration works of the early 20th century, designed by George Mackie Watson. 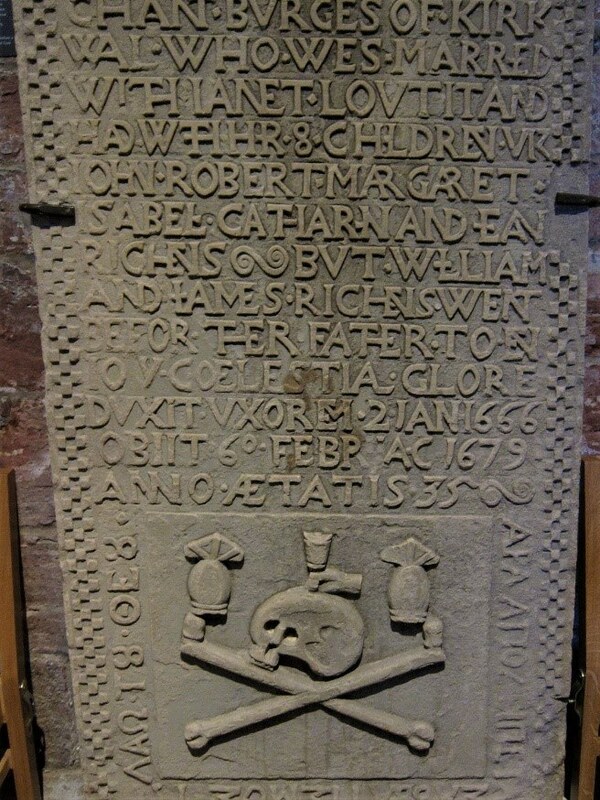 Whilst the restoration works were being carried out, the original relics of St Magnus were discovered in a casket secreted in one of the ashlar pillars of the choir – probably hidden there during the iconoclastic years following the Reformation. The casket containing them is in the Orkney museum, whilst the relics themselves have been returned to their hiding place.